One day the well of iPhone 6 mockup images will dry up, but today is not that day. Nowhereelse.fr shared another set of photos on Twitter this Thursday, giving us a fresh look at what could be the future of the Apple smartphone. The first set comes courtesy of Inner Exile, a China-based smartphone case retailer. 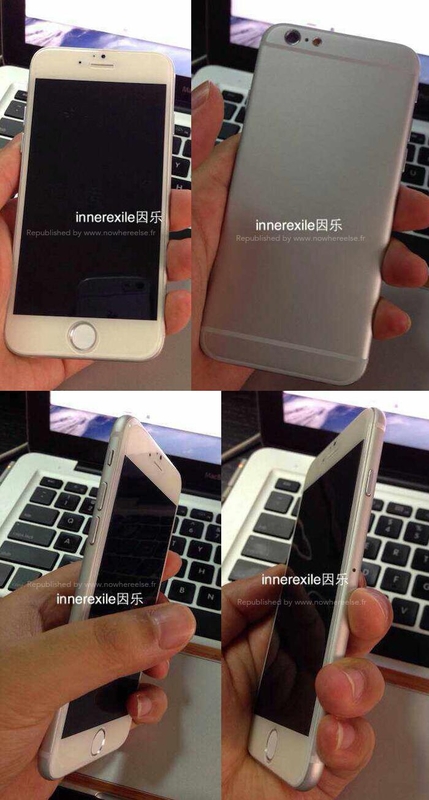 The iPhone 6 mockup appearing in the four photos provided by Inner Exile appears to be a silver iPhone, strikingly similar to the photo that we covered earlier this week. This time around, we get a closer look at the phone from multiple angles, showcasing the reworked button placement, the curved body and the larger display. The second image, which can be seen above the article, appears to give us another look at the space gray iPhone 6 mockup, which first appeared online just a few days ago. It’s apparent just how thin the iPhone 6 will be based on the leaked schematics that have led to these mockups. Based on previous reports, we won’t see the iPhone 6 in person until this fall, but with the countless mockups and renders that have flooded the Internet recently, it’s probably safe to assume that someone has managed to create a nearly identical clone. We’re still waiting to see physical mockups of the 4.7-inch and 5.5-inch phone side by side.